The illegal wildlife trade encompasses all types of live animals ranging from big cats and monkeys to tropical birds and reptiles. Even turtles and exotic fish are caught by poachers and trafficked across regional and international borders to consumers seeking pets, exotic cuisine, and folk medicines made from the bones, brains, teeth, or other parts of unique species. Individuals, regional syndicates, and transnational organizations (PDF) around the world participate in the illegal trafficking and sale of exotic animals and protected species without respect to local environmental sustainability, the safety of the animal, international law, or legitimate businesses that play by the rules. Successful syndicates and transnational organizations use their extensive business networks to improve the odds that shipments of illicit wildlife products will reach their final destination. These groups may use common tactics including forging documents, hiding illegal goods inside other products, and bribing customs officials and other authorities. However they also use traditional business methods in managing their supply chains and, directly and indirectly, establishing strong business relationships with accomplices, facilitators, and suppliers with some groups even negotiate guarantees (page 10) and fees for each type of wildlife product (page 12). In one example from 2016 (pages 10-11), undercover investigators were told by a trafficking syndicate operating out of Shuidong, in China’s Guangdong province, that Mozambican and Tanzanian suppliers of illegal ivory would reimburse the Shuidong-based syndicate in full for a 3,000 kilogram (6,613 pound) ivory shipment (up to $900,000) if it were confiscated by authorities along the way (page 11). Chinese syndicates which are able to insure that customs officials are paid off along the entire multi-port route a shipment may take from an African port to its final destination in Asia, and then be collected by a reliable third-party courier, are said to be able to provide a “dragon service” (pages 10-11). This level of comprehensive supply chain management further decreases the risks involved in the illegal wildlife trafficking trade and provides a more reliable service. In turn, this helps create financial stability for the illegally operating business. With robust networks in place, some of individuals and wildlife trafficking organizations also take part in cross-over crimes (PDF) that include poaching animals and plants; falsifying hunting or fishing licenses; human trafficking; trafficking firearms or ammunition, trafficking drugs and counterfeit pharmaceuticals; illegal mining; and smuggling undeclared products to avoid taxes. In destabilized regions of the world armed militia groups (page 8) have been identified as profiting from these endeavors by direct control of resources and illegal distribution or through illegal taxation on local peoples attempting to sell their goods (pages 7-8). The United Nations Environment Programme and Interpol estimate that the global illegal wildlife trade, illegal mining, illegal fisheries, and other environmental crimes, including the illegal timber trade, is worth $70-213 billion each year (page 4). Of this, the illegal trade in plants and animals – excluding fisheries – represents roughly $7-23 billion dollars per year (page 7). Transnational organized crime is a threat not only to wildlife populations and the tourism revenue that is generated from it, but also to governmental agencies susceptible to corruption and graft at all levels. Aided at every level by subsistence poachers, commercial poachers, organized crime syndicates and regional poaching syndicates, insurgent militia groups, or corrupt officials, illegal wildlife traffickers act as the middle-man between poachers and illegal wholesalers, legitimate businesses, Eastern pharmaceutical companies, and consumers. In June of 2014 Feisal Mohamed Ali along with four suspected accomplices (Abdul Halim Sadiq, Abdulmajeed Ibrahim, Ghalib Sadiq Kara, and Pravez Noor Mohamed) were found in Mombasa, Kenya with 228 elephant tusks and 74-86 other pieces of ivory stashed at a warehouse. The ivory cumulatively weighed 2,152 kg (4,734 pounds). The Kenyan national was charged with crimes in Kenya, and two suspects were arrested during the ivory seizure, but Ali quickly fled to neighboring Tanzania. On 22 December, 2014 Ali was arrested in Dar Es Salaam, Tanzania and two days later extradited to Kenya on charges of dealing in wildlife trophies and suspicion of being involved in an international wildlife trafficking ring. He pleaded not guilty to all crimes and faced a number of bail hearings since his December arrest and January 2016 trial. In July 2016 a Kenyan magistrate sentenced Ali to 20 years in prison, however Ali’s lawyers promised to appeal. Four other defendants, possibly his accomplices, were acquitted of related charges. In November of 2016, based on alleged irregularities in the way evidence was used to convict Ali but not his associates, his lawyers have sought to appeal the sentence. In August of 2018 this appeal resulted in the High Court in Mombasa overturning his 20-year sentence due to Ali having been convicted based on a law that was later repealed and on the basis that the prosecution had failed to prove beyond reasonable doubt that Ali had been involved in ivory trafficking. The High Court also indicated that Ali had already served his time in excess of the one year considered appropriate by the old law. This new ruling has been appealed by Kenya’s Director of Public Prosecutions. Since at least 2003, Laotian national Vixay Keosavang has operated three companies each tied to wildlife trafficking and laundering of illegal wildlife with the help of bribes to government officials who provide falsified documents so the animal parts can be legally imported by other nations observing CITES conventions. Transparency International’s most recent report from 2015 ranked Laos as 139th of 168 evaluated countries, placing it among the most corrupt countries in the world. In July of 2009 Kenyan authorities seized a shipment addressed to ‘Xeosavang Trading’ containing 280 kilograms (616 pounds) of illicit ivory and rhinoceros horn on the way from Mozambique to Laos. 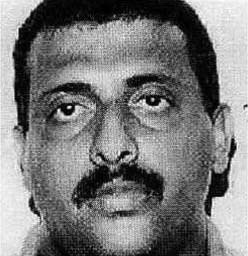 In addition to openly importing illicit goods, ‘Xeosavang Trading’ (Xaysavang Trading) along with his trusted associate, Thai national Chumlong Lemongthai, are known to have hired people to travel to South Africa and pose as legitimate hunters while staging hunts, even taking photos with the kill, before flying the trophies to Southeast Asia. Fraudulent hunts like these have hurt the South African trophy hunting industry which has repeatedly come under scrutiny as the result of a few businesses selling fraudulent hunts in the United States and South Africa. It has also caused South African customs agents to racially profile Asians who could be acting as mules for trafficking syndicates and outright ban the issue of trophy hunting permits to Vietnamese. Vixay’s ‘Vannaseng Trading’ and ‘Vinasakhone Trading’ companies were each authorized by the Laotian government to sell tens of millions of dollars of exotic wildlife bones, skins, and scales, including those that are completely banned for commercial trade at an international level. When confronted in 2013 regarding his businesses, Vixay denied being in the wildlife business. In November of 2013 the United States put out a $1 million award for information leading to the dismantling of Vixay’s well-established trafficking syndicate. 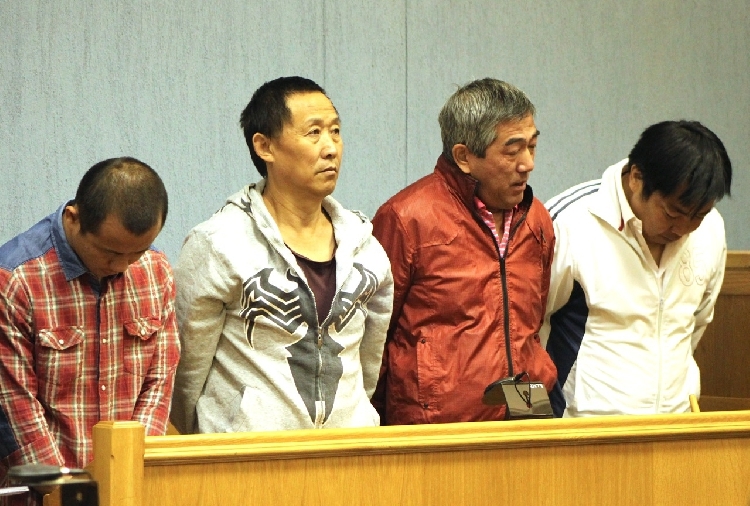 On 24 March, 2014 three Chinese nationals were apprehended at Hosea Kutako International Airport in Windhoek, Nimibia with two suitcases containing 14 rhino horns and one leopard skin. These raw wildlife products were valued at N$2.35 million (roughly $220,000), but the street price would be substantially higher. Wang Hui, with successful businesses in his home town in China as well as Angola and Zambia, was apprehended at a casino in 2015 and has been fingered as the ringleader of the smuggling operation, though the group’s defense attorney has denied that the group has any form of hierarchy. Prosecutors have used video evidence to show that the three others, Pu Xuexin, Li Zhibing, and Li Xiaoliang, were subordinates and receipts indicate that the trio’s airfare was paid by Hui. A chief inspector has also accused Wang Hui of offering him a bribe, an allegation that is currently under investigation. According to Zhibing’s own initial testimony they were aware of what products they were being paid $3,000 to transport. 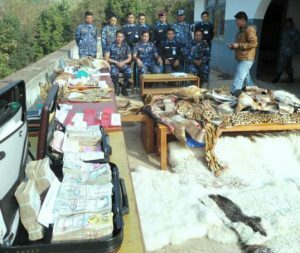 In 2015 they were charged with smuggling wildlife products, possession or export of illegal proceeds, and illegal dealing or possession of wildlife products. They initially denied guilt of all charges. On 30 September, 2016 the four men were each sentenced to 14 years in prison. In a separate incident in February of 2016 a Chinese national with a work permit and a Namibian citizen were charged with the illegal possession of 94 kilograms (207 pounds) of abalone, any of a group of sea snails and are currently threatened by illegal and unreported fishing. The Chinese national was additionally charged with illegally dealing elephant and rhinoceros parts and 1.5 kg (3.3 pounds) of rhino horn pieces were found in his possession. Bank details show that he had received or deposited nearly N$2 million (roughly $140,00) in multiple bank accounts under his name, which the prosecution claimed is more than he could have reasonably made from his work. Six cars were also seized from the two men. The trial is ongoing. Ivory Trader: A joint-operation between multiple law enforcement, wildlife protection agencies, and task forces around the world code-named Operation Cobra II (30 December 2013 – 26 January 2014) resulted in the seizure of more than 3,000 kilograms (6,600 pounds) of ivory, 36 rhino horns, over 10,000 turtles, and thousands of other animals and wildlife products. Among the successes during the course of the operation in Tanzania was the arrest of Yu Bo, a Chinese national allegedly in the country for business. He was caught at Dar es Salaam port in possession of 81 elephant tusks and 2 kilograms (4.4 pounds) of pangolin scales. Having plead guilty to his charges he was fined over 9 billion Tanzania Shillings ($6.5 million), but was unable to pay and was instead sentenced to 20 years in jail. Ivory Queen: In October of 2015 a Chinese businesswoman living in East Africa since 1975 was arrested by Tanzania’s National and Transnational Serious Crimes Investigation Unit for her extensive involvement in an ivory trafficking ring. The syndicate had a history of trafficking ivory going back to at least 2006, but may have been actively trafficking goods since early 2000. 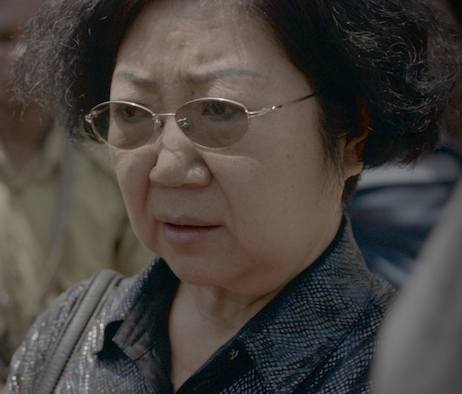 Sixty-six years old at the time of her arrest, Yang Feng Lan (also “Yang Fenglan”) had been dubbed the “Queen of Ivory” due to her alleged role as ringleader of the prolific trafficking ring and overseas connections. At the time of her arrest, she was alleged to have helped smuggle at least 706 elephant tusks from East Africa to Asia. This figure was later revised to to 860 pieces or whole tusks weighing 15,900 kilograms (35,053 pounds) which were trafficked using her local and international connections to bypass commercial trade bans. Facing a maximum jail sentence of 30 years, the sixty-nine year old was found guilty of smuggling only a portion of the 860 pieces of ivory she is suspected of having trafficked. During a February 2019 sentencing hearing Feng Lan received a 15 year jail term and each of her two Tanzanian associates received similar 15-year sentences. All three were also told to pay fines equivalent to twice the market value of the ivory or face an additional two years in jail. According to news site Mongabay, a Chinese Foreign Ministry spokesman said that China would support the outcome of the court case and was committed to contributing to the protection of endangered wildlife. Several of Feng Lan’s suppliers of ivory, as well as traffickers of Chinese nationality, were also arrested by the Tanzanian task force during the same operation. At the time of her arrest Tanzania’s NTSCIU is believed to have averaged one arrest per day since its creation. 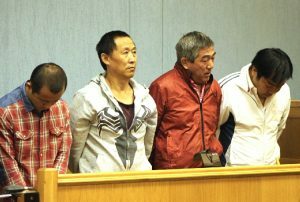 Rhino Horn Smugglers: In November 2015 the Tanzanian Police and the National and Transnational Serious Crimes Investigation Unit arrested four Chinese nationals (shown on right) on suspicion of smuggling. In December a Tanzanian court found them guilty on charges of unlawfully dealing in government trophies, unlawful possession of 11 rhino horns, and participating in organized crime. 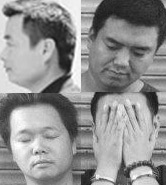 Chen Jianlin, Hu Liang, Song Lei, and Xiao Shaodan have been sentenced to twenty years in prison and a fine of 10 billion Tanzanian Shillings (roughly $4.6 million). Throughout 2017 and into 2018 the Royal Thai Police have conducted a number of “flash operations” targeting major traffickers of live animals and wildlife parts. These traffickers were operators of networks within Southeast Asia, both sourcing and enabling the illegal capture or illicit trade in the region and ultimately moving some of their products through Thailand. 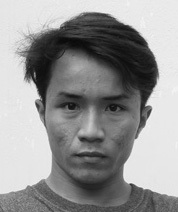 Pichart Muangsri was arrested on 11 March, 2017 in Bangkok, Thailand by Royal Thai Police during a joint effort dubbed “Operation Australia” with intelligence provided by Elephant Action League. Under surveillance by EAL for quite some time, he is believed to have been trafficking animals including live orangutans, birds, and valuable bird parts for more than 15 years. Several months later in December of 2017 the head of the Chaiyamart syndicate, Thai-Vietnamese national Kampanart “Sia Tang” Chaiyamart, was arrested by Royal Thai Police again with assistance from EAL. Kampanart Chaiyamart was first arrested and investigated in 2014 for his suspected role in an international smuggling operation with bank accounts, businesses, or other interests in Laos, Malaysia, Thailand, and Vietnam. Their activities included money laundering roughly ฿1.1 billion (over $33.3 million in 2013) and trafficking Siamese rosewood from 2010-2014, but is believed to have been engaged in illicit businesses and wildlife trafficking since 2000. His wife, sister, and other associates also had assets frozen and property confiscated by the Thai Anti-Money Laundering Office. After his release from jail, Kampanart Chaiyamart returned to operating the trafficking network which by 2017 was smuggling high value wildlife parts including pangolins, rhino horns, elephant ivory, and live orangutans. A photo from Khoa’s Facebook profile. On 3 December, 2015 the 22 year-old exotic wildlife trader and alleged smuggler Phan Huỳnh Anh Khoa was arrested by National Environment Police at a coffee shop during a sting operation assisted by the Education for Nature-Vietnam (ENV) and Wildlife Conservation Society. This arrest was the culmination of more than two years of investigations by Education for Nature-Vietnam after they had received a tipoff that Khoa was advertising for sale a protected species. On 21 June, 2016 he was sentenced to five years in prison and fined VNĐ 50 million ($2,242) for illegally selling wildlife. 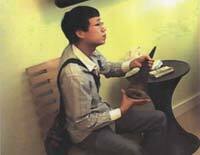 Khoa brazenly posted photos of himself with animals that he had for sale in his pet shop or which he was selling out of his home through clandestine meetings with prospective clients. Photos included posing with a baby tiger, various birds, sea turtles, leopard cats, a python, pangolins, and monkeys. According to his own Facebook profile he acquired some of the pet shop’s animals from sellers in Thailand and Cambodia, which he then brought to Vietnam on his own or with the help of a companion or mule. In one of his posts he brags that the month after he returns from abroad he is always very busy with customer orders. This was not the first time the young man had been investigated. On the rare occasions when the local police would investigate allegations of illegal sales of protected wildlife the shop would be cleared out and Khoa would be gone, one step ahead of the authorities. He had also been fined several times in the past, including a VNĐ 3 million ($134) fine from the HCM City’s Forest Protection Department, and once had been tipped off by an authority in the local government that he was being investigated by ENV. The organization has since speculated that tipoffs from the local government may have helped Khoa to avoid arrest in previous raids on the pet shop. Animals found in Khoa’s possession during his December 2015 arrest were given into the care of Cu Chi Wildlife Rescue Station which specializes in taking in confiscated wildlife and is operated by Wildlife At Risk. While small-scale poaching exists in the United States criminal syndicates are a lesser-known but larger contributor to wildlife trafficking of animal parts. In January of 2013 undercover US Fish and Wildlife Service agents arrested Chinese citizen Zhifei Li for trafficking 30 rhino horns as well as finished pieces of ivory and rhino horn from the United States to China. At the time of arrest he was attempting to purchase a rhino horn for $59,000. According to federal officials Li and his associates are known to have smuggled elephant ivory and rhino horn to China from 2011-2013. In 2015 the head of Elite Estate Buyers, a luxury action house in the United States, and owner of Elite Decorative Arts, plead guilty to trafficking a number of wildlife products from endangered species including rhino horn and elephant ivory. His business was fined $1.5 million and he faces a fine of up to $250,000.